Imagine sleeping inside a one-time grain silo. You can at Quaker Silo. This 19th Century former mill, complete with grain silos were the beginnings of the world famous Quaker Oats Company. The 120' round silos once housed the grain have been transformed into the rooms of the hotel. The large complex provides a one-of-a-kind experience. Located within walking distance to the University of Akron, Quaker Square offers unique restaurants, shops, and banquet facility complex, housed in the all brick factory mill. One thing you're sure to find at Quaker Square is a rich history including Ferdinand Schumacher's first attempts at selling breakfast oats. When visiting Quaker Square, you'll learn about the fire that nearly destroyed Quaker Oats, as well as the massive construction effort it took to transform the factory into a world-class hotel. Some of the original milling equipment is still in place and serves as a reminder of the building's historic origins. 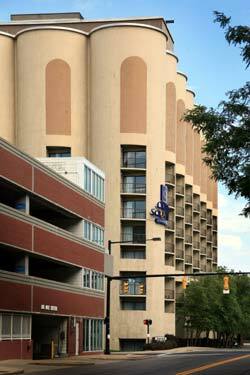 Certainly the cornerstone of the project to date is the innovative Crowne Plaza Quaker Square complex that's built into the cluster of 36 grain silos that were originally built by Quaker Oats in 1932, and once housed 1,500,000 bushels of grain. Ferdinand Schumacher introduced oatmeal, first to Akron and then to the whole United States. Remembering that, back in Germany, he used to grind oats and sell the meal as a breakfast food, he decided to try the same here. His product was so popular that, in 1856, he bought an old wooden factory along the canal and installed machinery so that he could grind 20 barrels of oats a day. The company name was German Mills American Oatmeal Company. With the start of the Civil War, he sold quantities of his oatmeal to the Army. In 1863 he moved to Mill Street, to the site of the present Quaker Square, and erected the Empire Barley Mill. In 1901, three companies including Schumacher's mill, joined forces to form the Quaker Oats Company.